PennDOT reminds its customers that they can take advantage of two voluntary, potentially life-saving programs designed to aid Pennsylvanians in emergency situations – the Yellow Dot and Emergency Contact Information programs. 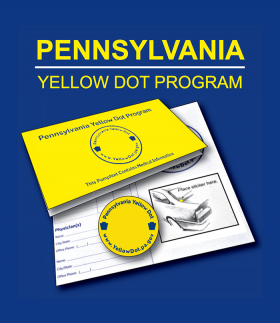 Participants in the Yellow Dot program enter their emergency contact, medical contact and medical information on forms inside a Yellow Dot folder and then place the folder in their vehicle’s glove compartment. Participants then place a Yellow Dot sticker on their vehicle’s rear window. This sticker alerts emergency responders to check a vehicle’s glove compartment for the folder, helping emergency responders provide specific care to participants after a crash. The Emergency Contact Information program offers Pennsylvania driver’s license and PennDOT-issued ID holders the opportunity to log into a secure database and list two emergency contacts. Customers can update the information as needed, but only law enforcement officials can view their information in the system. In the event of an emergency, law enforcement can use the participant’s ID to find their emergency contact information.While the Yellow Dot program is utilized only in vehicle crashes, the Emergency Contact Information program is usable in other emergencies as well as crashes. To learn more about the Yellow Dot program or to sign up for a program folder visit www.YellowDot.pa.gov.